Blog Post - Aug 9 — Stratus Events Inc.
Ok I get it, a lot of us aren’t morning people. Nothing feels better than constantly hitting snooze and staying nestled in your blanket cocoon....the last thing you want to do is jump out of bed to start your day. I’ve learnt over the years, especially as an entrepreneur, the first hour of everyday defines how the rest of your day will go. So why not make it as productive and effective as possible? I’ve outlined what my 60 minute morning routine includes below. Feel free to pick and choose what you’re inspired by to integrate into your routine and if you have any suggestions of other things I could do. Drink a glass of room temperature water with half a lemon - living in China, I learnt the benefits of drinking room temperature water especially early in the morning.....cold water shocks the body and actually makes it work harder to bring it back down to room temperature. Drinking a glass lemon water alkalizes (neutralizes) the body and kick starts your digestion for the rest of the day. Review your goals - during my days working at lululemon, I learnt the benefits of writing down your 1, 5 and 10 year goals with the SMART method. I’ll write a full blog post about this really soon but I make sure that I review my goals so I can remind myself of why I’m doing what I’m doing everyday. 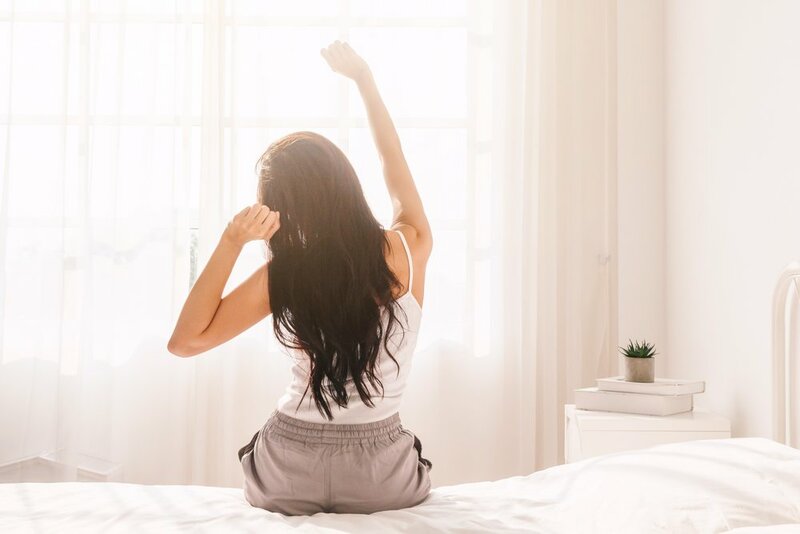 Wake that body up - I’m not one to work out in the morning, but to get the blood flowing, I usually do about 10 minutes of simple stretches and yoga poses. EAT BREAKFAST - people who skip their first meal BAFFLE me.....how are you supposed to do anything if you don’t have nourishment to pull energy from? I’m not a nutritionist so I won’t shed much light on what to eat but I usually have some fruit and grains and eggs occasionally. Stay off of social media - I really do my best to not check my personal IG/FB until I’ve gotten everything else done.....avoiding the news feed vortex is tough but the world isn’t going to end if you don’t check your notifications in the morning. Set an intention - Before checking your emails and/or notifications (depending on the kind of work you do), take a moment to think about what your intention is for that day. Whether it’s spiritual or work related, it feels good to come back to it through out the day and keep yourself on track. It could be something like “I will not be so hard on myself”. I adapted this from some great yoga instructors and notice a real difference in my day depending on the intention I set. Opening the dreaded inbox - everyone has their own way of sorting their inbox. I’ll get into how I organize mine in another post, but I like to get rid of all the junk, read and sort all of the informational/FYI emails and leave any emails I need to respond to or require action in my inbox. Setting priorities - there’s only so many hours in one day, so it’s important to figure out what you need to get done immediately. As humans, we always like to do the stuff that comes easiest to us first (for me I’m an excel junkie so I love to work on my excel based tasks) BUT your day will go so much smoother and be more rewarding if you do the work that comes more difficult to you first. I usually do a lot of my sales and client prospect work first as this takes a lot of time and research and making those calls and writing emails to set up meetings is not what comes the most natural to me. After all this, I’m ready to start my productive day with intention and the most efficiency possible. Of course not all of this happens for me everyday, but I do my best and am patient with myself if it doesn’t all happen :) I would love to know what you include in your routine and if you do any of the same things as me!